We've heard it many, many times. It's been preached endlessly by food "experts", chefs, nutritionists, all of them screaming from the TV, online or the newspaper not to buy store-bought stock. "A travesty to real cooking," they scream. "Not real," they yell. "A sodium time bomb," they warn. All true. All very, very true, but yet there's one problem with these warnings. Isn't it somewhat elitist to assume that everyone has the tools, or means to make homemade stock? 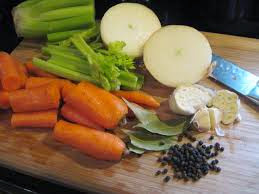 Back in my culinary school days, I learned to hone my chopping skills to make stock and all sorts of dishes. I chopped my way through gardens of onions, carrots, celery - the basic mirepoix for making stock. The cut could have been brunoise, if you want to be precise. Paysanne, if you want to be fancy. Or, an irregular, rough chop which is usually perfect for making stock. I quickly got used to perfecting these and other varying chopping methods every class. After a while, it just become part of the routine. Last weekend, I was making a dish that called for stock. I didn't have any fresh stock on hand, so I reached into the very back of my pantry for something I hadn't seen or used in years. Ready-made stock, just add water. As I said, it hasn't seen the light of day in almost five years, but I knew it would be still be as viable today as it was when I first bought it. That's a little scary to realize, but it's amazing how you can sometimes train your mind to overlook just about anything. Yes, I could have thawed a few frozen chicken bones from my freezer. I could have pulled out the onions, carrots and celery and started chopping away to make my own stock. God knows it's been drilled into me, but yet, this little thing called laziness, and "want-it-now" syndrome sort of crept in and prompted me to cheat. I could still feel the sweat on my upper lip as I ripped the seal open, and poured the yellow contents into a bowl. Maybe it was the sweat, or maybe it was the steam from the kettle, either way, as I poured the water over the insta-stock, the professional culinary years were raging inside me, questioning what the hell was I doing, when I knew exactly what to do and how long it would take for me to make a 'real' stock. Yet, still I poured and stirred, pretending not to know what I knew I was doing. 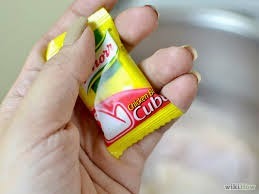 I remember a chef telling me in school that he was actually a fan of bouillon cubes. Trust me, I was shocked too. I asked him if he was serious and he said he totally was. He added that it's not exactly a secret for some Chefs to cheat a little when it comes to making stocks or sauces. It's like knowing you can make boeufe bourguignon at home, but grabbing a Big Mac instead. You do it because you can. Understand that I am absolutely an advocate for making your own stock. Beef, chicken, vegetable, definitely take the time to make it. It enhances your dishes with a serious, non-manufactured flavour. You know exactly what's in it because you made it yourself, and really, it doesn't take as long as you think it would to boil some bones and veg together. But, if you don't have any on hand and you really need it, I say buy the insta-stock, you know - in case of 'emergency'. Just be sure sure to put in the far back corner of your pantry. Not to hide of course - good heavens no, but simply for safe-keeping.